Point of view — I was struck as I read through the various essays written by Dr. Scott Haig, and published through Time and CNN during the past several weeks, how much point-of-view changes how we look at the world. More importantly, I have a better understanding about how communications improve when we see OUR world through someone else’s point of view. Here’s what I mean: Dr. Haig (like my guru Jerome Groopman, MD) uses point of view to help his patients understand what to expect from him and his treatment advice. And, even more important, he is able to elicit from his patients what they expect from him, from themselves, and from their treatment decisions. He helps them see his point of view. I believe that doctor-patient communications, and (I’ll even go so far as to say) patient outcomes, are rooted in that premise: that it’s important for both sides to see the other’s point of view. It’s a skill — and Dr. Haig seems to have mastered it. Another article talks about a football player who became Dr. Haig’s patient. They had a good relationship because Dr. Haig managed his the patient’s expectations based on what he knew about the patient — he was respectful of the man’s sports career, even though he really had no idea who the player was. And later, when the player returned for still more treatment related to his new career — pharm sales — Dr. Haig was able to take point of view into consideration to work with the patient. Here’s the problem. There just aren’t enough doctors OR patients who work with each other in this fashion. 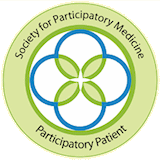 And I realize that it’s what I’m trying to do as I work on behalf of patients — helping them understand how the medical world has changed — giving them a sense of their practitioners and providers point of view — to help them get better care. AND — I try to do the same in reverse. 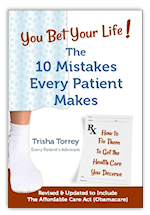 For those doctors and other providers who just don’t “get it” — it’s because they either refuse, or are incapable, of seeing their patient’s world through a patient’s point of view. Here’s your assignment for today: Pick someone you disagree with — a politician, a co-worker, a neighbor — and see if you can figure out his/her point of view. How do they see the world differently? What is their background for seeing it that way? And how do they see what you say and do through their own point of view? It doesn’t mean you have to like them any better. But once you can see their point of view, it will certainly help you understand why they say what they say and act like they do. And you’ll be able to communicate more effectively if you’re ever in a position to need that skill. Here’s another response to Dr. Haig’s article which you may not have read. 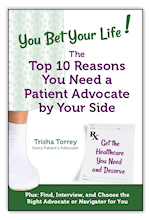 Google: Patient Empowerment or Patient Annoyance?